Review: Buddha Passion – Tan Dun (U.S. premiere, LA Phil commission) One-Night Left! Tonight is last night. Tan Dun, the composer for Crouching Tiger, Hidden Dragon and the LA Phil in celebration of the Chinese New Year present Buddha Passion. Performances are on February 9th and 10th only. Tan Dun is a genius! 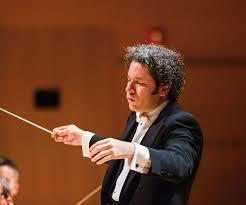 Dudamel at his brilliant best! The opera is a monumental new work sung in Chinese and Sanskrit, is scored for seven soloists, choir and orchestra. The world premiere of this astonishing new work by Tan Dun was on May 23, 2018 at the Dresdner Musikfestspiele at Kulturpalast Dresden in Dresden, Germany. Commissioned jointly by the Dresdner Musikfestspiele, New York Philharmonic, the Los Angeles Philharmonic, and the Melbourne Symphony Orchestra, the piece promises to “takes your breath away” (Dresden Music Festival). 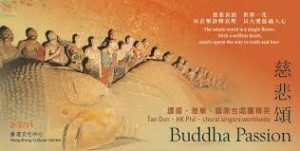 Buddha’s teachings and the timeless, universal concepts of love, forgiveness, sacrifice and salvation, Tan Dun has summarized these stories in the cave into six acts: The Deer of Nine Colors, A Thousand Arms and A Thousand Eyes, Zen Garden, Heart Sutra and Nirvana. Incorporating elements of water, air, nature, animals and man, this beautiful opera has musical tones that are unique to the ear. 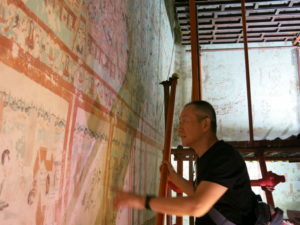 The composition is based on the teaching of Buddha with music inspired by the ancient city off Dunhuang and the drawings in the Mogao caves. A UNESCO World Heritage Site and under their protection for the last thirty years. Gustavo Dudamel, conductor, led the orchestra and the Los Angeles Master Chorale to heights of Nirvana for the audience — A long and grateful standing ovation confirmed that. Dun said in the after performance question and answer that Dudamel is the only conductor he met that does not need any explanation of the music. Dun’s success of translating images into music is remarkable and although I did not know what to expect prior to experiencing this concert, I now expect nothing less than more great works by master composer Tan Dun. This performance was on February 9, 2019. Last performance is February 10, 2019.